It’s hokey as all hell, but I find that yearly resolutions keep me focused, or at least a little organized in terms of what I want to accomplish in the coming 12 months. I’m going to list some of my favorite picks of right now, as a present for myself (and for you, dear reader!) next holiday season. First of all, here’s a link to my resolutions from last year. How did I do? Oh yeah. And it’s a blast. I prefer the seeded packs of my Uncommons Cube, but as a change of pace, or palate-cleanser, the Un-Cube is a riot. Combining the three sets, adding sets of uncommons/commons, deciding what comes out…it was an intellectual challenge. The weird thing is that while every new set/release changes what’s at uncommon, this Cube is going to be unchanging for quite a while. Done! GP Oakland, next weekend, is going to be my fourth GP in 53 weeks, and I’m doubtful that I’ll match that again for a while. I’m based on the West Coast of the USA, so we only get about one event about every four months. I’ve already decided I’m skipping GP LA this year. Sadly, both Jason and Travis skipped GP Vegas this past summer, so we didn’t have a chance to meet up. Chilcott is a delight, and his dad is a hoot, flashing sealed Revised starters with no protection in his bag at dinnertime. Vegas was a great time, and I got to Cube with a lot of new folks. Mostly done. I’ve got sheets to track what I spent and when, and I’m in the midst of picking my collection yet again. So many random things have spiked! The funniest so far has been the playset of Portal Goblin Lore. When did I pick those up? Semi-accomplished. I went in on a box of UMA for $230, I did indeed pick up playsets of Hadana’s Climb for $5, and other things like Dream Eater sort of hit. I’m still waiting on Earthcraft, Winding Canyons, Soulflayer, etc., but I feel good about this year and value-wise I’m up nicely. So what do I want to get done this year? I’m a high school science teacher by day, and I don’t think any of my students read my stuff here. There’s a surprising number of people who share my name, thankfully. What I do want to do is encourage the game at my school. I built a Battle Box for quick games, but there’s enough stores in the area that I should be able to arrange sponsorships, freebies, and discounts. I’ve got some binders/fat pack boxes of random stuff still in storage. I don’t think any of it’s valuable but I won’t know till I look. I do know there’s ~3000 basics and ~2000 tokens/rule cards/other inserts that I’m just going to dump in the recycle bin. If you saw the playmat-sized sign flashing the words CUBE DRAFT at a GP, that was me. I don’t like the way it works, though, and it needs some work. I think I want to have the lights be on the outside, or maybe have the lights spell the words, instead of surround the words. Like anything, it’s an iterative process. First drafts are exactly that, sadly. Oh, are we at that point? Very well. That’s actually my first gift to my future self: I’m trading for all the Toppers I can get, and I don’t much care which cards. Yes, even the manlands and Balefire Dragon. Right now, if you add up all forty cards, it comes out to about $3800. By January first, 2020, it’ll be over five grand. I think Cavern of Souls has the potential to be the most expensive eventually, because it’s much more widely played than Liliana and Goyf. A Topper version of Cavern is #1 on my shopping list for GP Oakland, and while these are more common than the Inventions/Invocations, we’re at the point where you want to get these. Usually for a Masters set, it’s about a six-month period before the cards reach their lowest, as the supply works it ways through everyone, but we’re seeing things creep back up. I find myself hoping that a second, small wave of UMA is announced, because of the dip that will follow. An exaggerated effect of this is what happened on MTGO when the $10 million prize pool was announced. If you bought in at the crash, you made something like 20% in a week. My second gift to your future self: The guild lands from GRN and RNA are going to all be $2+ by then. Yes, they are commonly available in the guild kits, but there’s only 8 of each and these are already close to $1 for the Izzet versions. The time will come where they are pricey. I’m picking up a dozen of each for my Cube and I’m stopping there. Probably. Maybe both Cubes. It’s been a while since basics have been so iconic, and while I don’t see a big rise in the much-much-rarer foil versions, the nonfoils are going to get bought up, put into collections/cubes/Commander decks, and supply isn’t going to last long. To be clear: I’m not advocating that you’ll be able to buylist these in a year for more than you’re buying them now. I’m telling you that if you’re thinking about it…get it done before the beginning of summer. My third gift to you: Prepare for Standard+. I wrote about this a couple of weeks ago, and that’s something we’re going to see this year. Remember, for all the attention, Arena is still officially in open Beta. Collections aren’t going to get reset again, though, so don’t fear that problem. Make sure you’re stocked up on shocklands and buddylands. Oh look, three months before rotation, a $15 card dropped to $5. 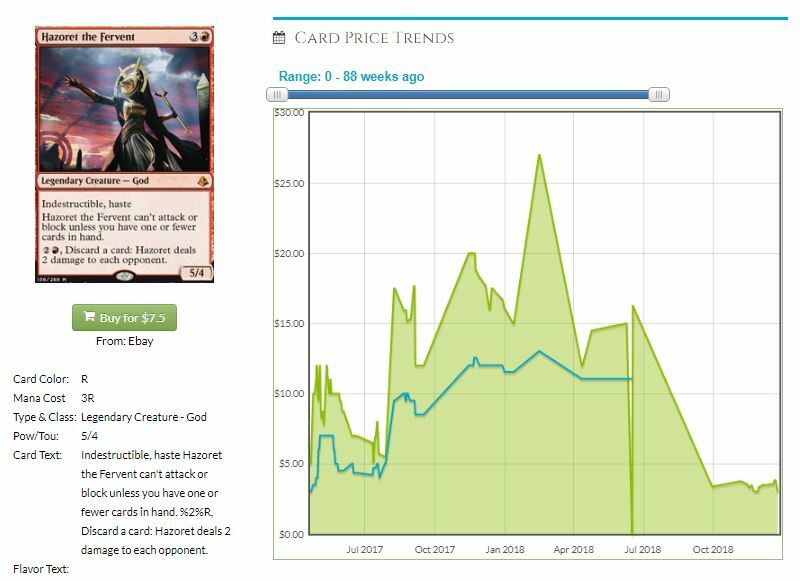 The peak was $25, the weekend Hazoret was all over the Pro Tour. If you keep some copies of Carnage Tyrant all summer, I sympathize, but that’s going to drop to sub-$10. It’s a singleton in some Modern builds, and won’t hold its price. Teferi, Hero of Dominaria looks like he’ll stay relatively strong, but he might go from $50 to $25. 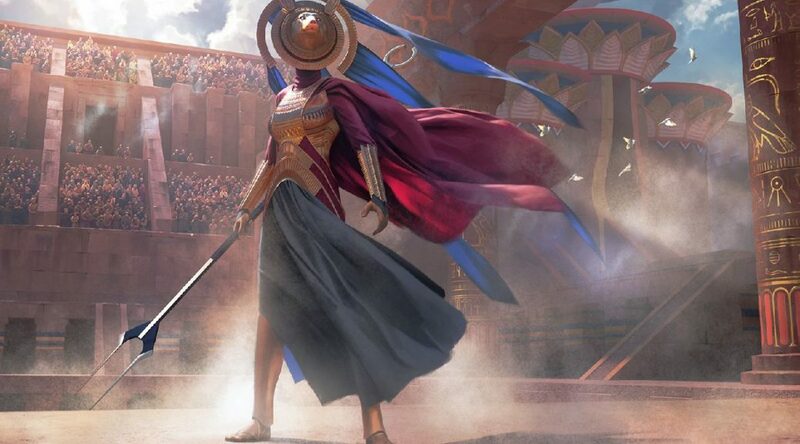 Ixalan, Rivals of Ixalan, Dominaria, M19 are the sets rotating and please don’t hold onto those cards longer than you needed to. Cliff has been writing for MTGPrice for five years now, and is an eager Commander player, Draft enthusiast, and Cube fanatic. A high school science teacher by day, he’s also the official substitute teacher of the MTG Fast Finance podcast. If you’re ever at a GP (next up: Oakland in January!) and you see a giant flashing ‘CUBE DRAFT’ sign, go over, say hi, and be ready to draft.